DIE Martis, 24o Januarii, 1737. "I have called you together for the necessary Dispatch of the Public Business; which I hope will be carried on with that Prudence and Expedition which becomes the Wisdom of Parliament. "I have ordered the Estimates for the Service of the current Year to be laid before you: And the Readiness which I have always found in you, to make the necessary Provisions for the Honour, Peace, and Security, of My Crown and Kingdoms, leaves Me no Room to doubt of the same Zeal, Affection, and due Regard for the Support of My Government and the Public Safety. "I hope you are met together in a Disposition to lay aside all Heats and Animosities which may unnecessarily protract this Session. I am determined that the Affairs of the Public shall suffer no Delay or Interruption from Me, upon any Account whatsoever." The Speech being ended; His Majesty was pleased to retire. And the Commons went to their House. 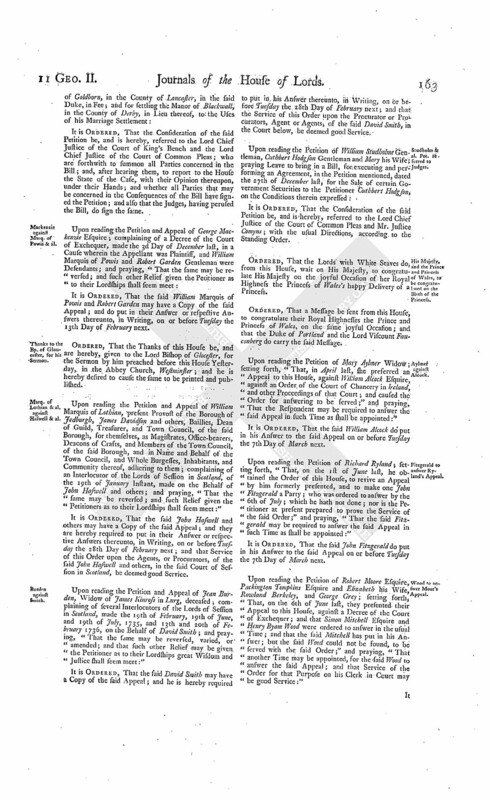 John Earl of Bute, Thomas Lord Bishop of Oxford, Thomas Lord Bishop of Bangor, Thomas Lord Bishop of Bristol, and George Lord Hay, at the Table, took the Oaths, and made and subscribed the Declaration, and also took and subscribed the Oath of Abjuration, pursuant to the Statutes. Address on His Majesty's Speech. Ordered, That an humble Address be presented to His Majesty, "To return the Thanks of this House, for His most Gracious Speech from the Throne. "To condole with His Majesty on the irreparable Loss sustained by His Majesty and these Kingdoms, in the Death of that excellent Princess our late most Gracious Queen. "To express the high Sense which this House retains of Her inestimable Virtues and Accomplishments; and to beseech His Majesty, so to moderate His Grief under this severe Affliction, as not to endanger the Health of His Sacred Person. "Humbly to acknowledge His Majesty's Gracious Declaration, that the Affairs of the Public shall suffer no Interruption from Him on any account, as a fresh Instance of His Majesty's making the Welfare of His People His First Care, in all Circumstances, and under all Trials; and as the strongest Inducement to lay aside all Heats and Animosities. "To assure His Majesty, that, as He has always founded the Glory of His Reign in preserving the Religious and Civil Rights of His People; so this House places their great Security, under God, for those invaluable Blessings, in the Safety of His Majesty's Person and Government; which they are determined, to the utmost of their Power, to support." E. Effingham. L. Bp. Glocester. Their Lordships, or any Five of them; to meet immediately, in the Prince's Lodgings, near the House of Peers; and to adjourn as they please. "We, Your Majesty's most dutisul and loyal Subjects, the Lords Spiritual and Temporal in Parliament assembled, beg Leave to return Your Majesty our unfeigned Thanks, for Your most Gracious Speech from the Throne. "It is with the greatest Humility we take this First Opportunity of approaching Your Royal Person, to lament the irreparable Loss sustained by Your Majesty and these Kingdoms, in the Death of that excellent Princess our late most Gracious Queen; and, with Hearts overwhelmed with Grief, to condole with Your Majesty on this melancholy and solemn Occasion. "To indulge ourselves in reslecting upon the many great and amiable Qualities which distinguished Her shining Character, and conspired to form the greatest Queen, the most endearing Consort, and the best Parent, that ever made a Prince, a People, and a Royal Family happy, would only serve to aggravate Your Majesty's just Grief, and make those Wounds bleed afresh, which it is our Interest, and shall be our Endeavour, to heal; for, if the Remembrance of the Blessings we enjoyed from the happy Effects of Her never-to-be-forgotten Virtues, adds so much to the general Affliction, how deep a Sense must it strike into the Breast of Your Majesty, the immediate and daily Witness of Her inestimable Accomplishments! "At the same Time that we presume to lay these imperfect Expressions of our real Sorrow at Your Royal Feet, we cannot but bless God for the Preservation of Your Majesty's most Gracious Life, on which the Welfare and Happiness of these Kingdoms do in so great a Measure depend; humbly beseeching Your Majesty, under this severe Misfortune, so to moderate Your Grief, as not to endanger a Health of such infinite Importance to all Your People, and to exert that Princely Fortitude of Mind, which alone can revive our disconsolate Spirits, and, by lessening Your Majesty's Grief, alleviate that of Your faithful Subjects. "Your Majesty's Gracious Declaration, that the Affairs of the Public shall suffer no Delay or Interruption from You on any account whatsoever, is a fresh Instance of Your Majesty's making the Welfare of Your People Your First Care, in all Circumstances, and under all Trials; and must be the strongest Inducement to us, if any were wanting, to lay aside all Heats and Animosities. As Your Majesty has always founded the Glory of Your Reign in preserving the Religious and Civil Rights of Your People, and steadily pursuing their Prosperity and Happiness; so we, in Return, place our great Security, under God, for those invaluable Blessings, in the Safety of Your Majesty's most Sacred Person and Government; which we will always support to the utmost of our Power, excited by all the Ties of Duty and Gratitude to persevere with unalterable Zeal and Affection in our Loyalty to Your Majesty, and an unshaken Regard to the Honour and Dignity of Your Crown." 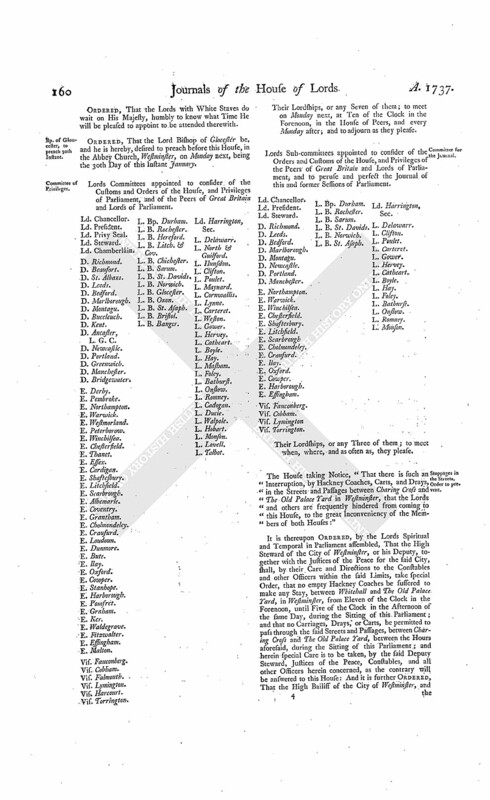 Which Address, being read by the Clerk, was agreed to by the House. Ordered, That the same be presented to His Majesty by the whole House. Bp. of Gloucester, to preach 30th Instant. Ordered, That the Lord Bishop of Glocester be, and he is hereby, desired to preach before this House, in the Abbey Church, Westminster, on Monday next, being the 30th Day of this Instant January. Vis. Torrington. L. Bp. Durham. Their Lordships, or any Seven of them; to meet on Monday next, at Ten of the Clock in the Forenoon, in the House of Peers, and every Monday after; and to adjourn as they please. L. B. St. Asaph. Ld. Harrington, Sec. It is thereupon Ordered, by the Lords Spiritual and Temporal in Parliament assembled, That the High Steward of the City of Westminster, or his Deputy, together with the Justices of the Peace for the said City, shall, by their Care and Directions to the Constables and other Officers within the said Limits, take special Order, that no empty Hackney Coaches be suffered to make any Stay, between Whitehall and The Old Palace Yard, in Westminster, from Eleven of the Clock in the Forenoon, until Five of the Clock in the Afternoon of the same Day, during the Sitting of this Parliament; and that no Carriages, Drays, or Carts, be permitted to pass through the said Streets and Passages, between Charing Cross and The Old Palace Yard, between the Hours aforesaid, during the Sitting of this Parliament; and herein special Care is to be taken, by the said Deputy Steward, Justices of the Peace, Constables, and all other Officers herein concerned, as the contrary will be answered to this House: And it is further Ordered, That the High Bailiff of the City of Westminster, and the Justices of the Peace for the City and Liberty thereof, or some of them residing in Westminster, be served with the Order of this House, made this Day, for the Purposes aforesaid. Dominus Cancellarius declaravit præsens Parliamentum continuandum esse usque ad et in diem Mercurii, vicesimum quintum diem instantis Januarii, hora undecima Auroræ, Dominis sic decernentibus. Sir Hew Dalrymple against Sir Alex. Hope. Upon reading the Petition and Appeal of Sir Hew Dalrymple, alias Hamilton, Baronet; complaining of an Interlocutory Sentence of the Lords of Session in Scotland, made the 18th Day of January Instant, on the Behalf of Sir Alexander Hope Baronet; and praying, "That the same may be reversed; and that an Interlocutor in the said Appeal mentioned, of the 16th of July 1736, may be affirmed; and such Relief given the Petitioner as to their Lordships shall seem meet:"
It is Ordered, That the said Sir Alexander Hope Baronet may have a Copy of the said Appeal; and he is hereby required to put in his Answer thereunto, in Writing, on or before Wednesday the 22d Day of February next; and that Service of this Order on his Counsel, or Agent, in the Court below, be deemed good Service. Causes left unheard, to be proceeded in. 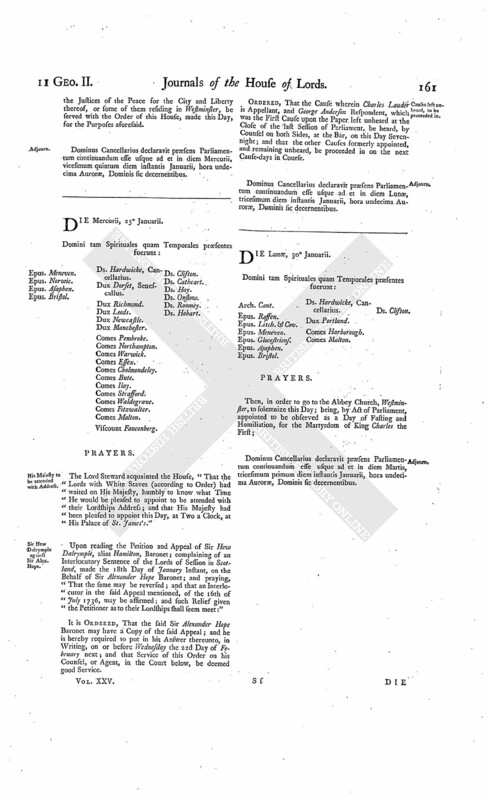 Ordered, That the Cause wherein Charles Lauder is Appellant, and George Anderson Respondent, which was the First Cause upon the Paper left unheard at the Close of the last Session of Parliament, be heard, by Counsel on both Sides, at the Bar, on this Day Sevennight; and that the other Causes formerly appointed, and remaining unheard, be proceeded in on the next Cause-days in Course. Dominus Cancellarius declaravit præsens Parliamentum continuandum esse usque ad et in diem Lunæ, tricesimum diem instantis Januarii, hora undecima Auroræ, Dominis sic decernentibus. Dominus Cancellarius declaravit præsens Parliamentum continuandum esse usque ad et in diem Martis, tricesimum primum diem instantis Januarii, hora undecima Auroræ, Dominis sic decernentibus. As was likewise, the Answer of Simon Mitchell Esquire, One of the Respondents to the Appeal of Robert Moore Esquire. "I thank you for this dutiful Address, and for your Zeal for My Person and Government. The affectionate Manner in which you express the just Sense you have of My great Loss, gives Me the most acceptable Proof of your real Concern for Me and My Family." Ordered, That the said Address and His Majesty's most Gracious Answer thereunto be forthwith printed and published. Accounts of prohibited East India Goods delivered. "An Account of prohibited East India Goods imported and exported, from Michaelmas 1736, to Michaelmas 1737; and an Account of Naval Stores imported from Russia, for the same Time." "No 1. An Account of the prohibited East India Goods in the Warehouses of St. Helens; with what hath been brought in, delivered out for Exportation, and what remains in the said Warehouses, between the 29th Day of September 1736, and 29th Day of September 1737." "No 2. An Account of the prohibited East India Goods in the Warehouses at Leadenhall; with what hath been brought in, delivered out for Exportation, and what remains in the said Warehouses, between the 29th Day of September 1736, and 29th Day of September 1737." "No 3. An Account of what prohibited East India Goods remained in His Majesty's Warehouse in the Port of London at Michaelmas 1736; as also what brought in since, what exported, and what remained at Michaelmas 1737." "No 4. An Account of prohibited East India Goods remaining in the respective Warehouses in the Out Ports of England at Michaelmas 1736; with what has been brought in since that Time, what exported, as also what remained at Michaelmas 1737." "No 5. An Account of Naval Stores imported from Russia into the Port of London, from Michaelmas 1736, to Michaelmas 1737." "6. An Account of Naval Stores imported into the Out Ports of England, from Michaelmas 1736, to Michaelmas 1737." D. of Devonshire, Pet. referred to Judges. 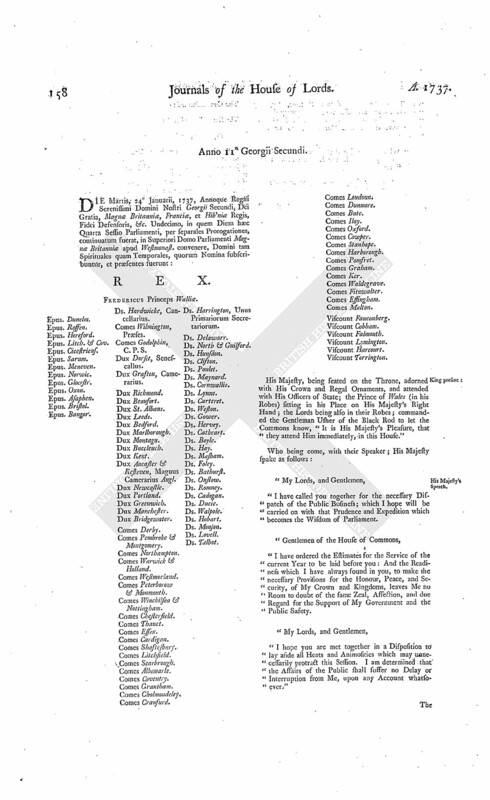 It is Ordered, That the Consideration of the said Petition be, and is hereby, referred to the Lord Chief Justice of the Court of King's Bench and the Lord Chief Justice of the Court of Common Pleas; who are forthwith to summon all Parties concerned in the Bill; and, after hearing them, to report to the House the State of the Case, with their Opinion thereupon, under their Hands; and whether all Parties that may be concerned in the Consequences of the Bill have signed the Petition; and also that the Judges, having perused the Bill, do sign the same. Mackenzie against Marq of Powis & al. It is Ordered, That the said William Marquis of Powis and Robert Garden may have a Copy of the said Appeal; and do put in their Answer or respective Answers thereunto, in Writing, on or before Tuesday the 13th Day of February next. Thanks to the Bp. of Gloucester, for his Sermon. Ordered, That the Thanks of this House be, and are hereby, given to the Lord Bishop of Glocester, for the Sermon by him preached before this House Yesterday, in the Abbey Church, Westminster; and he is hereby desired to cause the same to be printed and published. Marq. of Lothian & al. against Haswell & al. 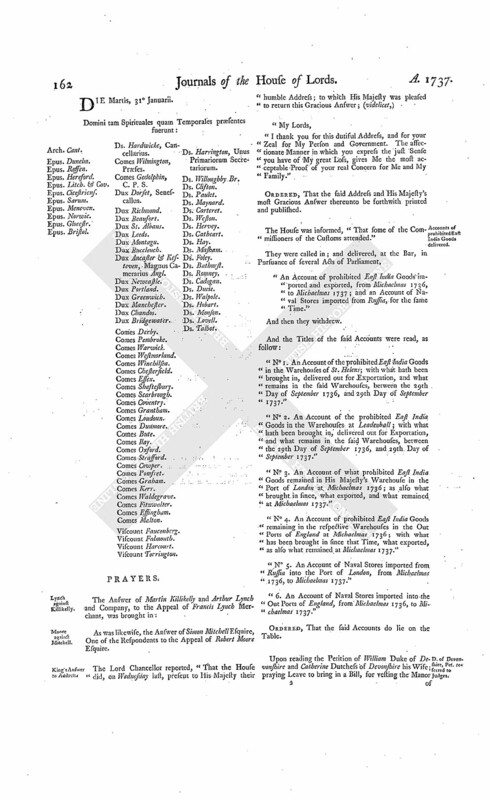 Upon reading the Petition and Appeal of William Marquis of Lothian, present Provost of the Borough of Jedburgh, James Davidson and others, Baillies, Dean of Guild, Treasurer, and Town Council, of the said Borough, for themselves, as Magistrates, Office-bearers, Deacons of Crafts, and Members of the Town Council, of the said Borough, and in Name and Behalf of the Town Council, and Whole Burgesses, Inhabitants, and Community thereof, adhering to them; complaining of an Interlocutor of the Lords of Session in Scotland, of the 19th of January Instant, made on the Behalf of John Haswell and others; and praying, "That the same may be reversed; and such Relief given the Petitioners as to their Lordships shall seem meet:"
It is Ordered, That the said John Haswell and others may have a Copy of the said Appeal; and they are hereby required to put in their Answer or respective Answers thereunto, in Writing, on or before Tuesday the 28th Day of February next; and that Service of this Order upon the Agents, or Procurators, of the said John Haswell and others, in the said Court of Session in Scotland, be deemed good Service. Upon reading the Petition and Appeal of Jean Burden, Widow of James Kinross in Lurg, deceased; complaining of several Interlocutors of the Lords of Session in Scotland, made the 19th of February, 19th of June, and 19th of July, 1735, and 13th and 20th of February 1736, on the Behalf of David Smith; and praying, "That the same may be reversed, varied, or amended; and that such other Relief may be given the Petitioner as to their Lordships great Wisdom and Justice shall seem meet:"
It is Ordered, That the said David Smith may have a Copy of the said Appeal; and he is hereby required to put in his Answer thereunto, in Writing, on or before Tuesday the 28th Day of February next; and that the Service of this Order upon the Procurator or Procurators, Agent or Agents, of the said David Smith, in the Court below, be deemed good Service. Studholm & al. Pet. referred to Judges. It is Ordered, That the Consideration of the said Petition be, and is hereby, referred to the Lord Chief Justice of the Court of Common Pleas and Mr. Justice Comyns; with the usual Directions, according to the Standing Order. His Majesty, and the Prince and Princess of Wales, to be congratulated on the Birth of the Princess. Ordered, That the Lords with White Staves do, from this House, wait on His Majesty, to congratulate His Majesty on the joyful Occasion of her Royal Highness the Princess of Wales's happy Delivery of a Princess. Ordered, That a Message be sent from this House, to congratulate their Royal Highnesses the Prince and Princess of Wales, on the same joyful Occasion; and that the Duke of Portland and the Lord Viscount Fauconberg do carry the said Message. 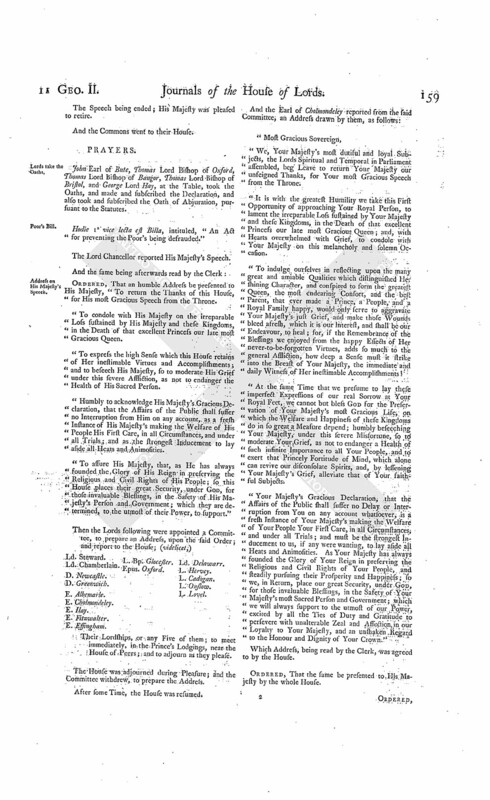 Upon reading the Petition of Mary Aylmer Widow; setting forth, "That, in April last, she preferred an Appeal to this House, against William Alcock Esquire, against an Order of the Court of Chancery in Ireland, and other Proceedings of that Court; and caused the Order for answering to be served;" and praying, That the Respondent may be required to answer the said Appeal in such Time as shall be appointed:"
It is Ordered, That the said William Alcock do put in his Answer to the said Appeal on or before Tuesday the 7th Day of March next. Fitzgerald to answer Ryland's Appeal. Upon reading the Petition of Richard Ryland; setting forth, "That, on the 1st of June last, he obtained the Order of this House, to revive an Appeal by him formerly presented, and to make one John Fitzgerald a Party; who was ordered to answer by the 6th of July; which he hath not done; nor is the Petitioner at present prepared to prove the Service of the said Order;" and praying, "That the said Fitzgerald may be required to answer the said Appeal in such Time as shall be appointed:"
It is Ordered, That the said John Fitzgerald do put in his Answer to the said Appeal on or before Tuesday the 7th Day of March next. Wood to answer Moor's Appeal. 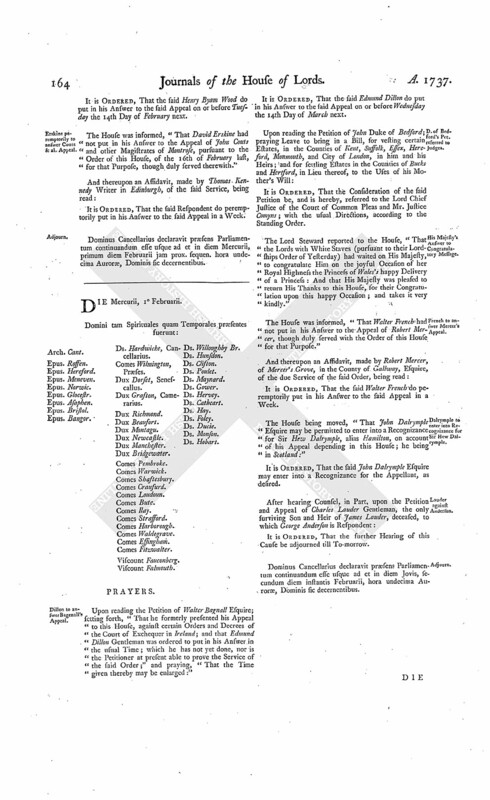 Upon reading the Petition of Robert Moore Esquire, Packington Tompkins Esquire and Elizabeth his Wife, Rowland Berkeley, and George Grey; setting forth, "That, on the 6th of June last, they presented their Appeal to this House, against a Decree of the Court of Exchequer; and that Simon Mitchell Esquire and Henry Byam Wood were ordered to answer in the usual Time; and that the said Mitchell has put in his Answer; but the said Wood could not be found, to be served with the said Order;" and praying, "That another Time may be appointed, for the said Wood to answer the said Appeal; and that Service of the Order for that Purpose on his Clerk in Court may be good Service:"
It is Ordered, That the said Henry Byam Wood do put in his Answer to the said Appeal on or before Tuesday the 14th Day of February next. Erskine peremptorily to answer Couts & al. Appeal. The House was informed, "That David Erskine had not put in his Answer to the Appeal of John Couts and other Magistrates of Montrose, pursuant to the Order of this House, of the 16th of February last, for that Purpose, though duly served therewith." It is Ordered, That the said Respondent do peremptorily put in his Answer to the said Appeal in a Week. Dominus Cancellarius declaravit præsens Parliamentum continuandum esse usque ad et in diem Mercurii, primum diem Februarii jam prox. sequen. hora undecima Auroræ, Dominis sic decernentibus.